There’s already a lineup that would bring tears to the eyes of even the toughest metalhead with bands such as Demilich, Satyricon, Decapitated, Paradise Lost, At The Gates & Moonsorrow… and just last week a cruise up the Norwegian fjords with live bands was announced as part of the first days festivities. We still have to hear more… the clinics, the stand up comedy, the exhibitions, and lots more have yet to be revealed! 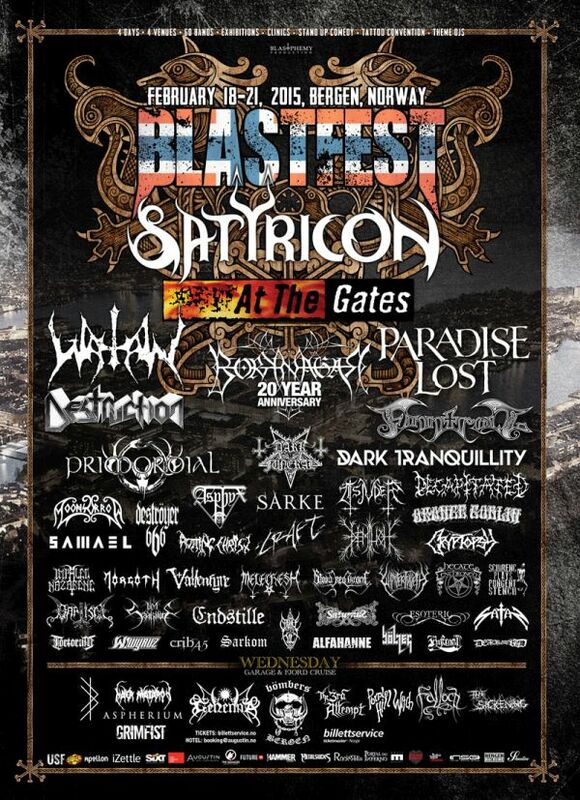 For now, let’s leave this here… Sweden’s Uppsala upstarts, the black metal powerhouse, the entity of its own who released possibly their best work to date just last year with ‘The Hunt’, yes, the mighty Watain have been announced as another Blastfest 2015 headliner. The festival has also welcomed Austria’s sickest death metal export Schrinec Plays Pungent Stench and Bergens blackened deaththrash horde Grimfist. Blastfest will be held 18-21st February 2015 in Bergen, Norway.